Ms. Walls is considered a leader in the area of environmental law in north Texas. Her track record defending clients from EPA and TCEQ enforcement proceedings is exceptional. 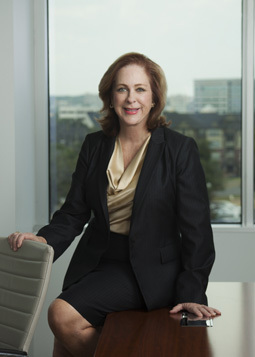 She is a founder and former Chairman of the Environmental Law Section of the Tarrant County Bar Association. She has served multiple times as Chair of the Environmental and Safety Committee of the Fort Worth Chamber of Commerce and on its Board of Directors. Ms. Walls has extensive contacts within federal, state, and local environmental agencies. Ms. Walls represents a wide variety of clients in the manufacturing, chemical, food and beverage, and aerospace industries, along with clients in the real estate, oil and gas, electric transmission, and transportation sectors. CERCLA and other environmental litigation. Administrative hearings before state, federal, and local environmental agencies. Representation of clients in environmental enforcement, permitting, remediation, and rule-making proceedings. Sales, purchases, and leasing of contaminated properties. Siting, expansion, and relocation of facilities. Brownfield issues, including successful completion of the Texas Innocent Owner/Operator Program, Voluntary Cleanup Program, and Municipal Settings Designations. Water rights controversies, storm water, wastewater, and groundwater. Internal investigations of alleged ethics violations, inflated earnings, kickbacks, environmental crimes, and other malfeasance. Listed in Best Lawyers in America by Woodward/White, Inc., for many years. Ms. Walls has been honored by the YWCA’s Tribute to Women in Business, the Fort Worth Business Press “Who’s Who in Business” and “Tarrant County’s Elite 100” and “Women of Influence” awards. “Right-fo-Farm, Nuisance Suits against Pork Producers, and Ag-Gag laws”, 2019 Food+Beverage Environmental Conference, New Orleans, La., April 1, 2019. Presenting at the 7th Annual Energy Symposium in Fort Worth with the topic “Environmental Regulation of Oil & Gas”. The Symposium is sponsored by the Texas A&M University School of Law and will take place on April 2-3, 2015 at the law school. Speaker, “Environmental Regulations for Architects: Practical Considerations and Tips.” Legal Issues for Texas Architects. “Biogas: An Alternative Energy Source”, a commentary in the March, 2013 Power Magazine. “Hydraulic Fracturing: Framing the Fracking Frenzy”, a white paper, was co-authored by Cantey Hanger partner Sarah K. Walls and published by the National Association of Realtors for its members in October of 2012. Speaker, “Defending Against EPA: A Success Story,” given in conjunction with client Frito-Lay. Conference on Environmental Engineering in the Food Industry. Speaker, “Pitfalls and Pratfalls of Investigating Your Corporate Client.” Meritas Annual Conference. Article and Speaker, “Environmental Case Law Update: I Still Haven’t Found What I’m Looking For.” Texas Environmental Superconference. Speaker, “All Appropriate Inquiry.” Texas Association of Business. Author and Speaker, “Environmental Indemnification Agreements.” State Bar of Texas Advanced Environmental Law Course. Author and Speaker, “Environmental Audits: A Lawyer’s Perspective.” Petro-Safe Annual Environmental and Safety Conference for the Oil, Gas & Petrochemical Industries. Speaker, “Top Ten Environmental Issues for Real Estate Lawyers.” Tarrant County Bar Association. Speaker, “The Designated Inmate: Defending the Environmental Manager Against Criminal Charges.” Society of Texas Environmental Professionals. Speaker, “A Lawyer’s View of the Barnett Shale: Legal and Environmental Issues.” International Petroleum Environmental Conference.